Usually associated with long distance passagemaking, keel cooling remains a viable alternative for reliable diesel engine operation. Rather than pumping raw water into your boat to cool down the engine through a heat exchanger, as is the common practice on many cruising powerboats, a keel cooler works much like the radiator in your car. Mounted on the outside of the hull a short distance from the engine, a keel cooler circulates the engine cooling circuit&apos;s hot coolant with the surrounding sea water, keeping the entire enclosed system at the proper temperature. This cooling circuit can include the engine block, the marine transmission, perhaps a cooler for lubrication oil, and a hot water heater for domestic use. Many custom and some production boats are fitted with keel cooling during initial construction. P.A.E.&apos;s long range Nordhavns, for example, are all keel cooled. And many custom metal boat builders build it in by welding long runs of pipe into the hull below the waterline during construction. Such simple techniques serve quite well for the life of the boat. But what about retrofitting a keel cooler onto an existing boat? After all, keel cooling remains somewhat of an oddity in today&apos;s cruising community, and it is not very common to see an older production boat with it. So, once you&apos;re convinced of the value and simplicity of the keel cooling concept, what is involved with putting one on a boat that already has a wet exhaust system and fresh water cooling through a heat exchanger? R. W. Fernstrum & Company is the leading manufacturer of keel coolers in the U.S. They have been in this unique business since WWII, when keel coolers were first developed to protect the cooling systems on landing craft. With a home on the Michigan shores of Green Bay, company president Paul Fernstrum has long been an avid boater. Until recently, however, he&apos;s been a sailing man, sailing his Endeavor 37 with his wife Sandy on Green Bay and Lake Michigan as much as possible during the short boating season of the Great Lakes. 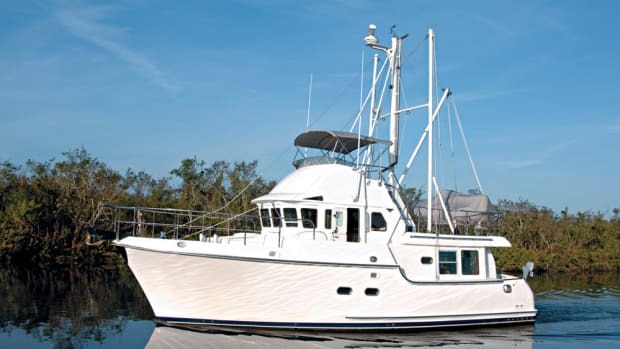 As with many other people these days, Paul and Sandy Fernstrum decided to make the switch to trawlers, so sold their Endeavor sailboat and bought a 1982 Island Gypsy 44 Motoryacht. The Island Gypsy, Hull #40, has twin Volvo TAMD60B diesel engines, each rated at 235 hp. This particular boat is unusual in that it sports a custom, enclosed flybridge that works and looks great. The Fernstrums expect this trawler to be their great family cruiser for the coming years of retirement and cruising from Michigan down south during the winter. As head of the Fernstrum operation, it&apos;s no surprise that Paul decided to put keel coolers on his new boat. Like all Great Lakes boaters, Paul has firsthand knowledge of the grassy weed and zebra mussels that plague the region, clogging through hulls, and creating maintenance headaches for all boats that travel the area. In addition, the local rivers and waterways near Monominee, Michigan contain a lot of dirt runoff and particulate matter. Paul Fernstrum knows well that keel cooling can do a lot to extend the life of boat systems that operate in these waters. Another motivating factor was that Paul planned to install three air conditioning units in the Island Gypsy, totalling 44,000 Btu. Traditional cooling of marine air conditioning systems uses small-diameter intake and discharge through hulls for pumping raw water through the condensers in the system. As part of ongoing research, the Fernstrum engineers recently developed a new "Smartcooler" for just such cooling applications, replacing the clogprone through hulls with a smaller version of their keel coolers. It seemed ideal to install the first prototype Smartcooler on the 44-footer, aptly named, American Dream. I was invited to come out to Menominee to see the project, and I jumped at the chance. It was a good opportunity to see the Fernstrum operation, the Green Bay area, and maybe sneak off to see more of Lake Michigan and nearby Door County. The work was well under way when I arrived, and Paul explained the steps of his project as he gave me a tour of the Fernstrum facility in Menominee. The twenty-two employees at Fernstrum build coolers for all kinds of vessels and applications, most of them destined for the commercial and fishing fleets. I saw large coolers, small coolers, bright new coolers made out of aluminum, and a couple of huge coolers being packed in wood cases destined for ferry boat service. I learned these guys make keel coolers one at a time, and the process is fascinating to watch. Each one is carefully handmade, almost a work of art - which is a real shame as it spends its entire life underwater, out of sight. To handle its air conditioning cooling requirement, the Island Gypsy would be fit with the prototype Smartcooler, sized to handle the combined needs of the three air conditioning units. It was also rated for zero water flow past the cooler, so it would be large enough to work at anchor or at the dock. The decision was made to mount the Smartcooler just below the waterline under the teak swim platform on the transom. Paul&apos;s son Sean Fernstrum explained that the most difficult part of this project was having to deal with older Volvo engines, which required different thermostat housings and adapters to fit the necessary hoses. While off the shelf adapters are readily available for Cats, Cummins, Lehmans, and Luggers, these particular Volvo engines are just not as common. "Each installation is unique," Sean told me. "And it&apos;s important to plan the entire job very carefully. But if you do your homework, it all comes together quickly and without problems." The plan was simple. Each engine would get its own Gridcooler (Fernstrum&apos;s name for their product line), and the new cooling system would be connected as a simple circuit: Coolant exiting the engine block would run down a short length of hose to the forward intake nozzle of the 60-inch-long keel cooler. The coolant would travel the length of the keel cooler&apos;s tubes, surrounded by sea water. 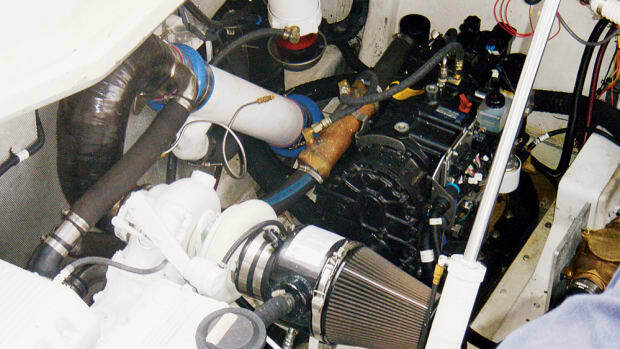 The now-cold coolant would exit the exhaust nozzle of the cooler, through hose connected to the gear cooler on the marine transmission. From there, coolant next runs through the engine&apos;s lube oil cooler (located on the side of the Volvo block), and finally back to the engine at the intake of the engine&apos;s water pump, completing the circuit. Paul chose to keep the Island Gypsy&apos;s wet exhausts rather than converting them to some form of dry exhaust system, so the existing raw water through hull and strainer would remain. They would be used to handle the wet exhaust, as well as the water-lubricated stuffing box. The adapter pieces took some time to locate for the Volvo engines, and it became necessary to fabricate new thermostat housings, as none were available for 18-yearold TAMD60B engines. Fernstrum&apos;s coolers are constructed entirely of copper-nickel (90% copper, 10% nickel). A 5000- series marine grade aluminum cooler is also available for use on unpainted aluminum work boats, but most keel coolers are copper-nickel. After assembly, each cooler is pressure tested in a water tank to check for leaks, then it is steam cleaned to remove any rosin or debris from inside the tubes. Any subtle bends are also hammered out before the coolers are crated for shipping. American Dream sat on her cradle in the boat yard when we drove over to check on progress. A man from the yard was busy glassing in some fairing blocks to the hull, to protect the ends of the coolers that were being bolted in place. The port-side cooler had just been installed, although they had not yet hooked up the connecting hoses. It was all pretty straight forward, except perhaps getting the proper twist in the cooler to match the shape of the hull. Paul and son Todd Fernstrum next prepared the transom for the Smartcooler. Using a paper template resembling the cooler&apos;s nozzle and stud holes, they carefully measured where they needed to drill into the transom. Ever so carefully, Todd then drilled a pilot hole in the center of each location, following it with a hole saw to complete the job. We took the cooler back to the shop to put in the proper bend on the transom-mounted cooler. It went on easily once we got the right shape. Beyond the simple task of attaching hoses and clamps to the main engines and the air conditioning condensers, the next stage was to get rid of air pockets when filling the systems with 50% antifreeze/50% water. Paul Fernstrum mentioned that they tried to avoid creating unnecessary high spots that could trap air. But he assured me there is always a way to purge these air pockets, even if it takes some frustrating moments to get them all. But then you&apos;re ready to go! As you can see from the pictures, the project isn&apos;t difficult, and makes for a reliable and carefree cooling system when done correctly. In the case of the air conditioning systems on American Dream, there are no underwater or waterline through hulls to clog with grass or jellyfish, and there won&apos;t be that annoying dribble of water to disturb a sleeping crew. Even tied to a dock with no current or tidal action, the Smartcooler will prove large enough to keep the air conditioning working. Quietly. I also didn&apos;t notice the stress normally associated with boat projects. Maybe that is because much of the work is outside the hull, or maybe it is just a result of careful planning. Either way, fitting a keel cooler on a boat is not a major undertaking. Problems in cooling systems are the most common type of maintenance and repair activity in the engine room. Adding a keel cooler can improve overall reliability of key systems, not just the main engines, and should be a consideration when you work towards your ideal passagemaker. American Dream is now enjoying her new life on Green Bay and Lake Michigan. And as she gets more miles under her keel, the crew can sit up on her comfortable, enclosed flybridge and be confident they&apos;ve made her even better. The folks at Fernstrum are real craftsmen in a decidedly niche business, although they are well known in the commercial and fishing industries. Fernstrum coolers are on boats around the world, each one handcrafted in the heart of America. Retrofit or new construction, keel cooling is another element in the continuing saga of finding ways to make a bulletproof engine room. And now, it seems, they&apos;re not just for engines anymore.